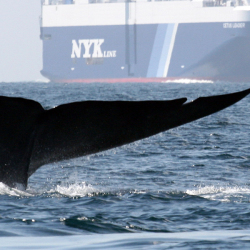 Whales may dwarf every other living thing on earth but they are no match for a cargo ship traveling at high speeds. Every year, whales are struck and killed by ships carrying goods around the world. In 2007, five blue whales were killed as a result of ship strikes in the Santa Barbara Channel alone. Because this was a much larger number of fatalities than usual, and due to the blue whale’s endangered status, this greatly concerned scientists.